Growing tall plants within the garden helps to provide a colorful backdrop to the space. Planted along a garden wall or lining a perennial bed, tall plants create a focal point to the space to draw your eye into the garden. Tall plants are also ideal to help provide privacy and can be planted in masses to create makeshift barriers. Grown in a wide range of shapes, sizes and colors, they create a commanding landscape presence. Elephant’s ear "Illustris" (Colocasia esculenta "Illustris") is a large tropical perennial plant with a clumping form and tall habit. They reach a maximum height of 6 feet and spread of 3 to 6 feet wide to create an ideal tall plant for the garden. The giant, heart-shaped leaves on elephant's ear have prominent deep green leaves that are accented with burgundy to create the attractive foliage. Elephant’s ear thrives in moist, hot conditions and requires consistent water. They grow best in dappled sunlight to part shade and boggy conditions that range from medium to wet soil. Elephant’s ear requires nutrient-rich soil that is slightly acidic in nature. Elephant’s ear "Illustris" grows best in USDA zones 8 to 11. Red hibiscus (Hibiscus coccineus) is a perennial flower with an upright form and attractive blooms that emerge in mid- to late summer. Each large, bright red funnel-shaped flower grows up to 6 inches wide and typically lasts for only one day. 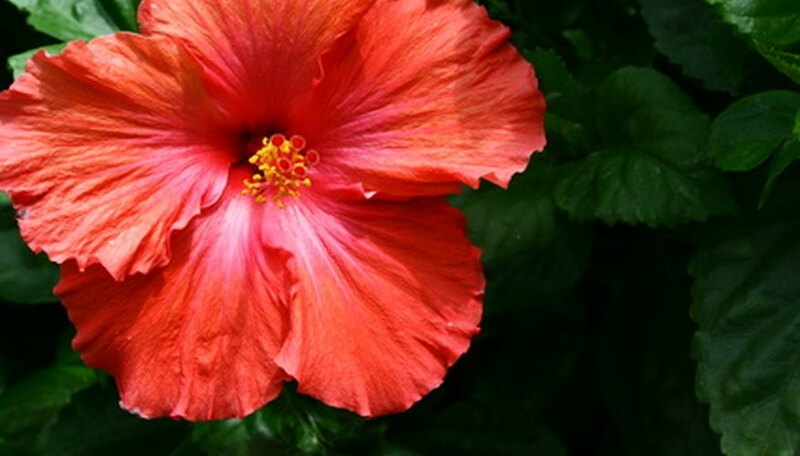 Red hibiscus grows 6 to 8 feet tall for an ideal plant to grow as a backdrop within the garden. They grow best in full sun and moist soils that are nutrient-rich. Red hibiscus tolerates poor drainage and can be grown along a garden water feature or other wet area of the garden. Plant red hibiscus flowers in USDA zones 5 to 9. Hollyhock (Alcea rosea) is an herbaceous perennial flower that begins blooming in June to last into August. They grow up to 8 feet tall and have a spread of 1 to 2 feet wide for a tall garden flower variety. The 4- to 5-inch funnel-shaped single blooms face outward and grow in a wide range of colors including crimson, pink, yellow, white and lilac. Each flower appears on the enormous spikes to create a line of bright color. The large, heart-shaped foliage on hollyhocks is three-, five- or seven-lobed and it has rough leaves that become smaller as you work your way up the spike or spire. Hollyhock flowers attract hummingbirds and butterflies to the garden and provide ideal height to the landscape. Hollyhocks require full sun and well-drained soil with a medium amount of moisture. They tolerate a wide variety of soil conditions. Plant hollyhocks in USDA zones 2 to 10. Fine Gardening: Elephant's Ear "Illustris"